The FNB-V94 has been replaced by the FNB-V126LI-UNI for Vertex two way radios using the new universal chargers. 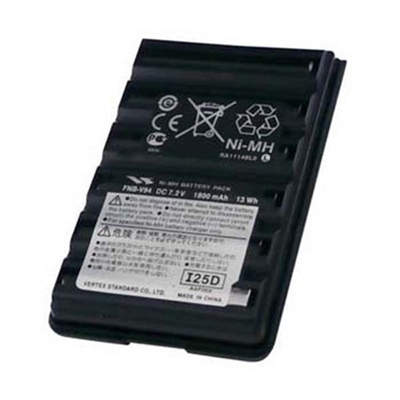 The FNB-V94 is the replacement battery for the FNB-V57 and FNB-V83 and is a higher quality 1800 mAh Nickel Metal Hydryde Battery. The Vertex FNB-V94 is a compatible with the VX-160 and VX-400 Series portable two way radios. The battery typically holds about 12 hours of talk time. This product is covered by a one year warranty.